Julie Ann Voytovich, beloved mother of Archpriest Steven Voytovich, Dean of Saint Tikhon’s Orthodox Theological Seminary, South Canaan, PA, fell asleep in the Lord on Friday, December 15, 2017. Born in Gilman, WI on September 26, 1940, the oldest of three children of George and Julia Victory, she grew up on the family farm. Prior to her marriage to Tony Voytovich of Huron, WI on August 4, 1962, Julie Ann converted to Orthodox Christianity. They moved to the Minneapolis area in 1963, where they worked together in the real estate field. They were members of Saint Mary’s Cathedral and sang in the cathedral choir. After her husband’s repose from cancer on July 6, 1989, she worked for Universal TItle Association until her full retirement. Most recently, she relocated to Gilman, WI, where she faithfully served as choir director at Saint John Church for many years. 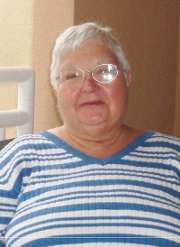 Julie Ann is survived by her son and daughter-in-law, Father Steven and Matushka Cindy [Shakun] Voytovich; her daughter and son-in-law Anne and Attorney John Del Vecchio; two grandchildren, Anna and Alexei Del Vecchio; and two younger brothers, Donald of Bloomer, WI and Thomas of Gilman, WI. Visitation will begin at the Plombon Funeral Home, 135 Riverside Drive, Gilman, WI at 4:00 p.m. on Friday, December 22. A Panikhida will be celebrated at 7:00 p.m. Visitation will continue at Saint John Church, Route G, Huron, WI at 10:00 a.m. on Saturday, December 23, with the Funeral slated to be celebrated at 11:00 a.m. Interment will follow in the parish cemetery. A light meal will follow at the Huron Town Hall. Memorial donations may be made in Julie Ann’s memory to Saint Tikhon’s Seminary, PO Box 130 South Canaan, PA, 18459. May Julie Ann’s memory be eternal!